FESTIVAL REVIEW: Spool runs at The Teachers Club until Saturday 9pm and Saturday has a matinee at 4pm. Two handsome young men are tied together in a beautiful exploration of the pressures faced by young men in exploring modern masculinity. Engagement with social media can confuse and prioritise the physical self from the critical uniqueness of the individual – the emotional self. How do you survive today if one dominates the other? 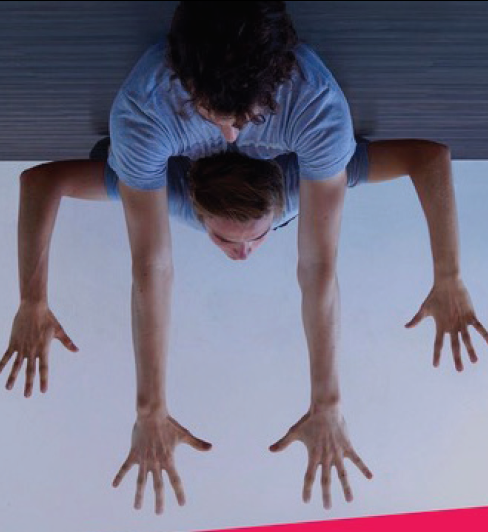 Finn Cooke and Otto Farrant demonstrate how these two are different – one balletic, one literal, both are inter-dependent. Both sleep, wash, play, breath and dance together in perfect harmony. The pressures of modern existence become too much when one feels he can survive away from the other. This is a blend of physicality, dance and intellect with some beautiful balletic moments, strong and humorous imagery, innocence and relevance. Farrant and Cooke shed all physical inhibition to blend, perform and flow together until cut in two. Can one survive just in body or just in mind in modern society where image is all and communication of the person’s value diminishing in a virtual world?